Sally Wingert in UNDERNEATH THE LINTEL. Photo by Allen Weeks. Underneath The Lintel (Theater Latte Da, at the Ritz Theatre) is, to say the least, an unexciting title, but Glen Berger‘s rollicking and rip-roaring play is the bomb. In it, a “librarian” (she has no other name) finds a book returned some 75 years late and this inspires in her a frenzy of investigation. Who checked out this book in 1913? Who!? Demure and contained to the point of invisibility, the Librarian finds herself travelling to the U.K., to Germany, to New York City, to China, Australia, Palestine/Israel. And back, back in time. The action becomes increasingly garbled (but still compelling). Finally, we find the Librarian scrawling wildly (in chalk) “I was here!” On everything. Whose idea was it to make Underneath The Lintel such a savage comic romp? Actor Sally Wingert? Or director (and Latté Da artistic director) Peter Rothstein? I care not. Wingert had me laughing throughout, starting with her brilliant entrance (which I won’t describe). Wingert prowls and paces, smilefully raging, effortlessly taking control of the play. As her search for the miscreant book taker-outer becomes dangerous and incoherent, I laughed even harder. Wingert’s performance is perfection. See it. Theater Latté Da in Minnesota’s premier purveyer of musical theater. So they had to add some music to Underneath The Lintel. The program boasts “original music by Frank London.” And it’s there, entirely played behind a scrim. There are two musicians: keyboardist Dan Chouinard (also the musical director) and bassist/singer Natalie Nowytski (who provides some lovely wordless, Hebraic singing). The music doesn’t detract from the action, which means, I think, that it works. John Olive is a writer living in Minneapolis. His book, Tell Me A Story In The Dark, about the magic of bedtime stories, has been published. John’s The Voice Of The Prairie has been performed 100 plus times and ditto Minnesota Moon and his adaptation of Sideways Stories From Wayside School. Please visit his informational website. Underneath The Lintel has an interesting disconnect between the play and the promotional photo. 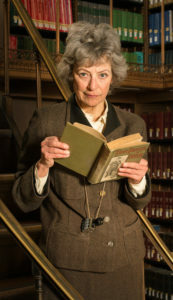 The latter shows Sally Wingert wearing a frowsy suit and leaning against a wall of books, reading an ancient volume. This led me to believe that the play would be dry, bookish, dusty. Imagine my delight when Underneath The Lintel turned out to be wild and breathless. IOW: don’t be fooled by the photo.